Small (4-6) - $48.99 Only 4 left! Is your kid ridiculously helpful? Are they cheery all the time? Do they have a soft spot for presents, Christmas, and the big jolly guy? They do? Well then are you sure that's your kid? We don't mean to insinuate anything, but we happen to know that a bunch of Santa's elves went on holiday and haven't come back for the Christmas season. Last we had heard, they were hanging out with families where they passed of as sweet helpful little kids (they found it easy to blend in). So yeah, your kid could really be that sweet and helpful, but do Santa a solid, and just check to make sure that you have your kids and not elves, okay? Can't hurt to check. Though, we suppose we should tell you how to identify them. Turns out that they usually don't have pointy ears (common misconception). Honestly, all of the elves are a little different, so it's not easy to determine if they're human or not, but we've found a pretty reliable method. 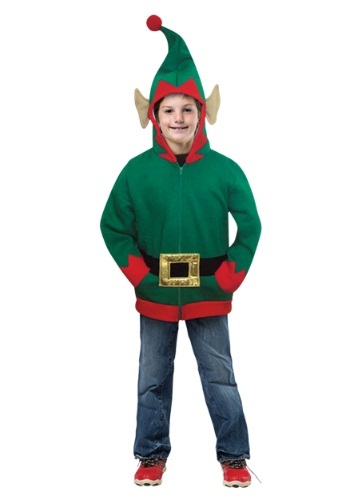 Put your kid in question in this Child Elf Hoodie. It fits like a normal zip-up hoodie, but it's got a faux belt, belt buckles, and a pointed hood with faux ears. We've discovered that this is too similar to Santa's elves' uniforms. So if you put your kid in it and they behave normally, you're fine. If, however, you put your kid in this little number and they immediately start singing, caroling, and fixing toys? Well then, you should call the big man in red. He'll know what to do.